Media dis&dat: Hollywood's disabled actors protest NBC's 'Ironside' casting - When is it their turn? 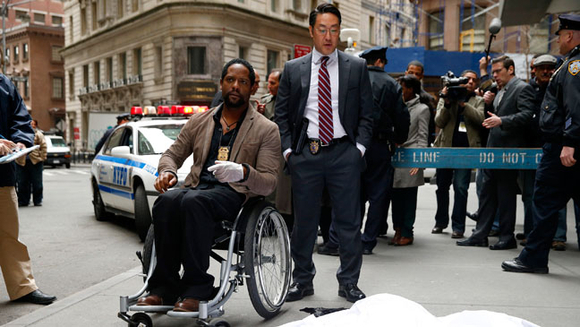 Hollywood's disabled actors protest NBC's 'Ironside' casting - When is it their turn? When the '60s procedural "Ironside" is revived on NBC this fall, the setting will move from San Francisco to New York and the lead character will be African-American (non-disabled actor Blair Underwood who is playing Ironside is pictured). But one thing hasn't changed: The actor playing Ironside can still walk from his wheelchair when the director yells cut. The colorblind casting is ironic to some disabled actors -- who say having a walking actor play a paraplegic is as offensive as blackface. "This would be like being in the '50s and having a white guy do blackface, at this point," said "Sons of Anarchy" star Kurt Yaeger, an actor and pro BMX rider who lost his left leg after a motorcycle accident. "You need to start having disabled people playing disabled characters. Period." NBC declined to comment to TheWrap on the "Ironside" casting, and on whether any disabled actors auditioned for the role, which went to Blair Underwood. But five disabled actors who spoke to TheWrap said film and television should at least give them a chance to play characters whose struggles they truly understand. Their point comes ahead of a 2013-14 television season in which NBC is putting three disabled characters front and center. "The Family Guide" features sighted actor J.K. Simmons as a blind lawyer, and "The Michael J. Fox Show" addresses the actor's real battle with Parkinson's, a disease of the nervous system that causes tremors and limits motor control. All are part of a trend toward greater visibility for characters with disabilities. They include the paraplegic chorus geek played by Kevin McHale on Fox's "Glee"; Terry O'Quinn's John Locke on ABC's "Lost," and a man with paralyzing muscular dystrophy played by D.J. Qualls on FX's "Legit." All the actors are able bodied. They follow the path of Daniel Day-Lewis, who won his first Oscar for playing a quadriplegic man with cerebral palsy in 1990's "My Left Foot," and Raymond Burr, who played the original "Ironside." Besides Michael J. Fox, some of the only people detailing their own physical struggles onscreen are the women in Sundance's docuseries "Push Girls," which returns for its second season June 3. Auti Angel, a paralyzed actress and musician on the show, wonders why shows don't want the perspective of an actor who is disabled -- or as she prefers, "differently abled." "What are they afraid of?" she asked. "There are so many extremely talented individuals who are performing artists with a different ability." Angel's fellow "Push Girls" star, Angela Rockwood, says she doesn't object to "Ironside" because the drama, like her show, challenges perceptions of how those in wheelchairs should look and act. All of the "Push Girls" are young, glammed-up, and athletic. The five actors who spoke with TheWrap said they all believe the best actor should win a role -- as long as disabled actors are given an opportunity to compete. And they said there are circumstances in which it makes sense to use an actor who can walk. Larry Sapp, a paralyzed independent filmmaker who is campaigning against the "Ironside" reboot with the Facebook page "Don't Shoot Ironside," said he believes O'Quinn's casting on "Lost" was a case where it was reasonable to use an actor who can walk. "That is legitimate," he said. "You had to get an able-bodied actor to play that role because 90 percent of his role was walking around on that island." But Robert Romani, an actor born with spina bifida who has appeared as a featured background player in shows including "Castle," "It's Always Sunny in Philadelphia" and NBC's "Law & Order: SVU," said almost no role needs to be off-limits. "Any director worth his salt can use a stand in," Romani said. Networks often say they need to cast big names. But there lies a Catch-22: There won't be any disabled stars until disabled actors are given prominent roles. Sapp cited a report that claimed NBC's pickup of "Ironside" was contigent on Underwood playing the lead. While members of Hollywood's tight-knit disabled community interviewed by TheWrap could rattle off names of disabled ctors they felt were capable of taking on the role, none could say if any -- like Mitch Longley ("Las Vegas"), Robert David Hall ("CSI") and Daryl 'Chill' Mitchell ("Brothers") -- had been asked to audition. Tobias Forrest, an actor and rock singer who became a paraplegic after a diving accident at the Grand Canyon 15 years ago, commends "Glee" for giving him a shot at McHale's role. He was called back several times to read for it. "Ultimately, my gripe is I need to be able to get into the room, at least," Forrest (left) said. "And if it's something that close to my life, then the opportunity to go into the room to win them over is really what we're looking for." Yaeger said disabled characters should get to play disabled characters -- and not just disabled characters. "I want disabled characters being played by disabled people, but i also want characters that were written as able-body to be played by disabled actors," Yaeger added. Ray Bradford, SAG-AFTRA's former national director for policy and diversity advocacy, and independent feature film casting director Pam Dixon agreed it's much more difficult for disabled performers to find success in Hollywood, but wouldn't blame it on discrimination. Instead, they both emphasized the word "exclusion." "Every group over the decades has come from a place of exclusion to, little by little, inclusion," Bradford said. "When it comes to performers with disabilities, there has been progress, but there's still a long way to go." Dixon, who was once the senior vice president of casting at ABC, says part of the problem is that there aren't many places where casting directors and producers can find disabled talent. The Los Angeles' Media Access Office -- a once-rich resource for talent -- has closed and many disabled actors aren't represented by agents or managers. Dixon hopes to launch a possible solution this summer in the form of ActorsAccess.com -- a database of all disabled actors, which will work in conjunction with industry-leading casting tool Breakdown Services. And it's "inclusive," meaning able-bodied actors can register for the service, too. "You have to win on your talent, but if you don't have the opportunity, you can't do it," Dixon told TheWrap. Hollywood's disabled actors also realize that a good portion of their opportunities depend on writers. And since writers write what they know, the first step is helping them get to know more about people with disabilities. "The second step is to allow us to come in," Rockwood said. "And if we're not good enough, then by all means, go out and hire an able-bodied actor to play the role."